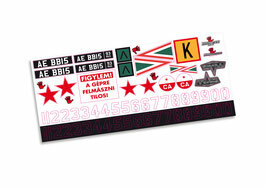 Cross RC BC8 License Plate Decalset 1:12 - STICK WITH US! This set contains 4 license plates with the letters and numbers of your choose. We added some extra: Soviet stars, Stencil numbers, MAZ logo's and some extra decoration for your truck. *Enter your license plate number in the comment section.